SUCH IS THE POWER and creative breadth of this second release by Colin Towns’ six-piece, Blue Touch Paper, this may indeed be a case of needing to draw breath! The composer and pianist/keyboardist is hugely respected in both jazz and rock worlds – and, with a career that includes a prolific contribution to TV, film and theatre, the writing here reflects that rich eclecticism. For this exciting project, Towns employs a remarkable, fearless band to achieve the challenging diversity of his mind’s eye – Mark Lockheart (saxes), Chris Montague (guitars), Edward Maclean (bass), Benny Greb (drums) and Stephan Haass (percussion and electronics). Unsurprisingly, there is a strong sense of dramatic soundtrack within these twelve originals; and the field of play is so vast that I also hear jazz/rock textures suggesting the likes of Weather Report, Brand X, Colosseum II, King Crimson, Nik Bärtsch, maybe some semblance of ’70s heavy prog., and perhaps even Zappa. Yet there is a magic in the way these threads are expertly woven together to create something new, whilst also allowing freedom of expression and improvisation (something which Lockheart and Montague grasp with both hands in their typically matchless soloing). Fuse lit, the percussively-activated ‘Attention Seeker’ opens the album brightly (Stephan Maass a key colorist in the band), Mark Lockheart’s instantly-recognisable and spirited tenor technique coupling with Chris Montague’s edgy guitar. From its mysterious keyboard opening, the theme-tune-like ‘Isadora’ gathers pace into a samba frenzy before relaxing into raunchy anarchy, Lockheart’s gritty tenor encouraging ‘the boys’ to vocalise along. The distant, floaty piano and plaintive sax of ‘Heaven’ offer a brief interlude, and then… ‘Suddenly a Tango’ lives up to its name, Colin Towns’ energetic marimba/brass keyboards and piano, along with bass and percussion, providing the perfect foundation for Montague’s distinctive experimentation. A smouldering, Spanish-implied ‘Juggling with Strangers’ takes us back to film or TV score territory. Lockheart sounds remarkably Shorter-esque on soprano, Maclean’s supple five-string bass is delightful against complex clapping rhythms and sympathetic percussion, and Towns on piano feels the hypnotic vibe. Theatrical and mocking, with braying keyboards and sax, ‘The Joke’ might be the stuff of nightmares… except that it’s actually a tour de force, with a terrific, rocky climax. Through the ‘fog and filthy air’, ‘Fair is foul’ portrays Macbeth’s macabre coven via soprano sax, tolling bell, chants, ‘fx’ and dramatic quotations (Towns is a master of such imagery). Continuing this tangle with darkness is the thrilling, urgent ‘Watch Out’… but keep running and don’t look back! Lockheart’s disembodied tenor on title track ‘Drawing Breath’, against searing keyboard strings, rumbling bass and wailing vocal, has me reaching for the light switch – but not before I can enjoy Chris Montague’s resonant, stressed, sitar-style lead guitar over the thunderous drums and percussion of Greb and Maass. Echoic nightscape ‘Neon Shadows’ again has the imagination running wild, catchy bass groove underpinning soprano sax as well as the scratches and scrawls of guitar and electronics; and ‘Yes But Now’ quickens the pace – a great platform for the whole band involving Montague’s trademark Fender pyrotechnics and crazed bluesy piano from Towns. With credits rolling, the cryptically-named ’48 Prefabs and Forks No.60′ appears to calmly draw down the curtain on a rollercoaster ride of emotion and adventure. As Colin Towns says, he doesn’t subscribe to any kind of rule book – “music either moves you, and your heartbeat goes, or it’s nothing at all”. 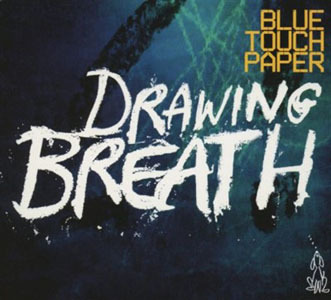 ‘Drawing Breath’ is released on 14 October 2013, touring in February 2014 (10-minute promo video here).